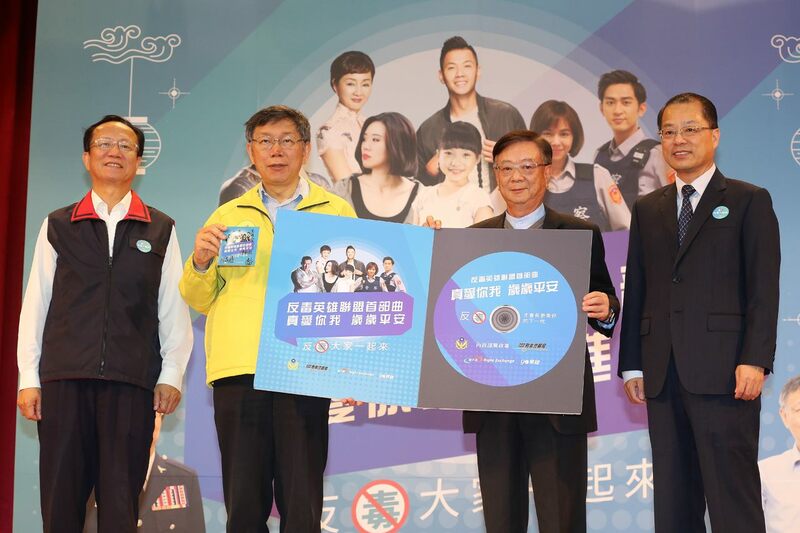 On April 1, Mayor Ko Wen-je attended the press conference for the release of “True Love You & Me – May You Be Forever Safe from Harm” anti-drug welfare microfilm. Ko emphasized in his speech the serious problems that drugs are imposing upon our society, and further pointed out that such highly complicated problems usually could not be solved by relying upon a single solution. Therefore, to resolve drug-related issues, one would need to act starting with preliminary awareness campaign, including drug enforcement, and continue towards helping former addicts rebuild their life and bringing them back into the society. Mayor Ko also stated that the anti-drug campaign is a series of actions that are impossible to be carried out by any department alone. To actualize anti-drug efforts, a special drug enforcement unit has been placed under the Criminal Investigation Division of Taipei City Police Department (CID); Taipei City Government has also set up a drug abuse prevention center, at which the mayor personally hosts the meetings. All tracking issues will be re-confirmed. He also requested the Taiwan Taipei District Prosecutors Office (TPC) to have all anti-drug cases handled by an exclusive team of prosecutors. The mayor continued to say that it's no use innocently believing that drug problems can be solved as single-faceted issues; each and every department needs to put in an effort. Citing a recent drug party incident, not only do the police need to go off to make arrests, staff from the Department of Information and Tourism (TPEDOIT), as well as those from the Taipei City Office of Commerce (TCOOC), all need to work together. If we need to shut such illegal operations down, then we should; otherwise making arrests is still useless. This is not only about the police making arrests, but if authorities need to cut off water and power to these venues, or need to work with other departments, then it should be done. He pointed out, as the city government is currently conducting the anti-drug propaganda, the campaign should be publicized on school campuses. On the other hand, Taipei City also has the Northern Star project in place. The mayor mentioned that there needs for a place where kids could ask for help when their parents find their children using drugs. That's the reason behind the creation of the Northern Star Hotline (TEL: 0800-770-885), ensuring that kids who encounter these problems have a place where they can ask for help. He also went into details on how the anti-drug campaign works: if a teacher is talking on stage for 30 minutes, he or she would figure, after about 5 minutes, students sitting in the classroom will all be dozing off. So promotion efforts need to be more animated, and that's why the city government has decided to adopt a more “cheerful” campaign targeting youths, to allow students to absorb the messages we seek to convey. At the end of his address, Mayor Ko expressed his appreciation for donations from private companies and for their collaboration with the National Police Agency (NPA) on making the anti-drug video. He hopes that future anti-drug propaganda would be more cheerful, whether it is in the form of internet videos or comic books. A stereotypical video would not be acceptable, since having students dozing off while watching is certainly not the proper way to do it. The goal for future campaigns is to make the overall event more engaging so that kids will not lose interest. We will keep working on it.